The main qualities we looked for in testing these headphones are high sound quality, a good bass, comfort and durability. These features along with individual preferences can help you decide which ones are going to be right for you. Check out the table below for an overview or read the short review of the top eight studio headphones. 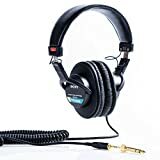 These headphones are rightfully one of the top sellers in the stereo headphone category and also very reasonably priced. Their collapsible design lets you store them easily and makes them a great choice for traveling. They also are designed to be worn for long periods of time. The padded ear pad design fits over your ears applying adequate pressure to stay on without making your head sore after long periods of use, while still staying in place when you’re moving around or even working out. The fitted design also ensures excellent sound isolation. If you plan to wear them a lot in noisy environments where its essential to block outside noise, these headphones provide an excellent listening experience. You’ll also be impressed with the sound quality. They provide a natural, clear sound at all volumes without being scratchy or blocking out any tones. The bass balance is excellent and it’s perfectly appropriate without standing out or being too weak. Overall, the ATH-M50x offers an excellent listening experience at a great price. The one-year warranty provided is also a nice touch. This model certainly packs a punch when it comes to awesome sound quality and has rightfully won several awards for sound quality. Although they are open-backed, or semi-open as the manufacturer states, they can still deliver a banging bass that is full, rounded and deep. They are a little bulky, but for the daily use they’re super comfy and lightweight. When testing the K702 the only negative thing we could find is that they sometimes move around a little when you move too rapidly. The sound quality really impressed us, with physical user tests confirming that the specifications of these headphones actually stand up in real life, delivering all-round quality audio in just about every aspect. The K702 is also able to translate sound decisions such as the EQ with ease, and it is extremely precise when you are attempting to fine tune a specific note or set. They’re great at doing what they’re supposed to in terms of creating music magic. The only real disadvantage is the size, making them too bulky for some people. If you’re a mixer by trade or by passion or somebody looking for professional quality sound, then you should certainly consider K702s. A fantastic model from a brand you can have full confidence in, the DT770 is the big brother of the popular DT150 model which is only around $40 cheaper yet lacks many of the innovative designs on this one. For mixing, you definitely need this model rather than the cheaper version because slight tweaks here and there have made this closed-back phone an 250Ω powerhouse. Tracking is also possible at high quality thanks to the great dynamics which are compressed. They are professional headphones and it is obvious that care and thought has gone into not only the design process for user-friendliness, but also has undergone extensive testing in-house before production to get those sounds and features tailored perfectly to almost any studio set-up. The balance of tone in each earpiece is perfect, and the mid-range is ideal for completing just about anything you want to achieve. In comparison to the K702 these stand out more because of the clear quality of audio they give. They are also durable and sturdy, which means you will have your money returned to you via awesome quality in the years to come that you use them. These wireless headphones are very comfortable and can be worn for extended periods of time without causing any discomfort. They also have a Bluetooth headphone so you have greater versatility and options. The active noise-cancelling technology makes them a good choice when you’re in a busy or noisy space, which is one of their main selling points. Like previous models, you can fold them up into a compact form for easy storage. The battery life is certainly decent and offers up to 12 hours of wireless listening, although other headphones will last for almost twice as long. Finally, you can use these headphones as a wireless headset as needed. The main disadvantage of the Beats Studio Wireless headphones is that they are one the more expensive side. They’re almost twice as much as some of the other headphones on this list, so many users are not willing to pay the high price tag. However, the bottom line is that they offer good quality. These are one of the newer products on the market today. Shure is a great company that is known for their excellent design and their products are very highly rated. The SRH840 is one of just another top model. The fit of these headphones is great and they’re made for professional applications so they’re designed to be comfortable and fit well. The sound is also worth noting. It’s detailed and controlled while still being extremely natural with its closed-ear design. While some headphones have trouble with the treble, you won’t notice any problems with this area. They also come with a two year warranty which is slightly unusual, but definitely nice to have. The price is less than $200, which makes them a great choice for full-sized headphones. With this model, Shure makes a definite statement without costing a significant amount. Of course, Sony is one of the largest companies on the market today that produces headphones and other electronics. While these headphones are a good choice, they’re not going to be a top choice. Their main advantages are the comfort and good sound that they provide. While they don’t have the same richness and depth of other models, they do offer reasonable performance and are one of the least expensive pairs out there today. So if you’re in the market for studio headphones but can’t spend a lot of money, these offer a good quality for an exceptional price. Like other models, these feature a closed-ear design and they’ll block most outside noises although some may leak through. The only significant disadvantage is that they don’t have a great design, so they won’t be as stylish as other models. However, given the low price these are a reasonable choice. They can also be folded for compact storage and are notably rugged, so they’ll stand up to heavy duty use. Bludio isn’t the most recognized name when it comes to headphones, but these ones are certainly worth noticing. The Legend builds upon previous models and the makers have been sure to keep everything that users liked about the previous ones while also adding aptX and Bluetooth 4.0. Like the previous model, these headphones are collapsible, so they’re easy to carry. They also have a sturdy built and a good weight that feels comfortable. Probably what makes these headphones stand out is their connectivity options. The NFC bluetooth pairing is popular. However, if you don’t want to use this option, you also have the choice of an audio cable, or even a microSD card. The sound quality is very good, although the mid ranges are can be affected when playing music that has a heavy bass presence. All things considered, these headphones are a good option. They’re packed with features and have a great battery life. Although they do tend to leak sound, the quality and solid build still make them a decent option. When searching for the right over-the-ear headphones, it is important to know the different categories they fall into: closed-back and open-back. These styles also fall into subcategories: casual and professional. Most brands will offer headphones that are best for relaxation or casual entertainment, as well as those which you would use strictly in a professional recording studio or when mixing music. With a little more knowledge on the two styles, you will be able to make a more informed, calculated decision. If you need a pair of headphones that will allow you to relax and listen to your music with great delivery, or you simply need the right pair to help you tune out the world around you, closed-back headphones are what you should look for. Both are great designs but what you will actually be doing on a day to day basis should determine your final choice. As you can probably infer, closed-back headphones are those that have a solid plastic (or in some designs, metal) shell covering the outer part of the ear cup. This allows for the user to utilize noise cancelation and engulf themselves in their music and escape the world around them, so they are typical among commercial brands. If you’re someone who intends to spend a lot of time tracking, then you may already know that a closed-back pair of headphones would be the best option for you due to the fact that excess noise is cancelled out which can affect microphones and other receivers. These are a popular style anyway, and more of these are bought by the average consumer than the open-back version. Many popular brands will tout how their headphones have the best noise-canceling technology, which in most cases is very true and quite the luxury, but such a characteristic is in some way inherent for closed-back headphones. Most headphones with cups that snugly surround your ear with big, cushy pads, will allow for quite a bit of noise cancelation even without the built-in technology. And being as though the closed back is lacking any perforations, little noise is allowed to escape into your surrounding environment. This is probably the most obvious difference when compared to open-back studio headphones. Although they cup your entire ear with soft pads just like the closed-back headphones, open-back have holes or perforations that allow much of the sound to escape into your environment. However, these perforations allow for a different, often preferred sound. Unlike closed-back which create that “in my own world” experience, open-back create the feeling that you are in the same room as the music; like the band is playing right beside you. If you intend on mixing and recording music, this style is your best choice, and in your search you will find that most professionals prefer them to closed-back. It has been noted, however, that closed-back headphones are beginning to make their way onto the professional scene as noise-canceling technology is becoming easier to work with in the studio. To say it once more, If you’re more of a mixer than a tracker, then you will be sure to find a pair of studio quality headphones that are open-backed at a price well within your budget. The open-back design has been popular for many years and it is still a thriving market today. Most manufacturers now produce both versions rather than specializing in just one, but some brands are rated much higher than others in specific headphone niches. If you are looking for good quality, relatively inexpensive pairs, brands like Panasonic, Sony, Bose, Pioneer and Beats by Dre offer some of the best commercial noise-canceling headphones. These usually range from $40 to $400, depending on extra features and the popularity of the brand. Panasonic and Sony offer some of the less expensive, but quality headphones. According to many online reviews, if you don’t mind spending some more cash and are looking for something with a hot style and a popular name brand, along with great sound and noise-canceling abilities, then brands like Beats, Bose and Pioneer are the way to. You will find with these brands several options for headphones that will allow you to isolate your concentration and engulf yourself in your music experience. However, when searching for professional, in-studio, top-quality sound, be prepared to spend more money. Understandably, professionals are very particular about their choice in studio headphones. They are going to be in search of the brands that offer the best distinguished sound qualities, comfort ability and mixing reliability. Although the brand names are not as popular as the commercial names, brands such as Sennheiser, Grado and Ultrasone offer some of the best and most preferred professional studio headphones on the market. These headphones usually range from $1,000 to $1,800 but are certainly worth the money if you want to maximize your listening, mixing and recording abilities. Although the best headphones receive the highest prices, you can also find a few brands that meet you somewhere in the middle. Brands like Audio-Technica and AKG offer some of the more relatively inexpensive headphones without sacrificing the characteristics professionals look for. These can be found online for around $140-$200. Being as though there are endless options for headphones on the market today, it is very important that you do your research before making your decision. And given the myriad of online reviews to sift through, hopefully you are now better equipped to narrow your search. Whether it’s a closed-back or open-back studio headphone technology is peaking; take advantage before the perfect pair for you is off the market. And after you make your selection, don’t forget to listen to Studio [feat. BJ The Chicago Kid] with your new gear.